Getting linked from a high-profile website is almost always a huge compliment, well-received by any blogger. But Monday morning, I saw two friends taken by surprise when they were featured on the front page of AllThingsD, the Dow Jones-owned news site edited by Kara Swisher and Walt Mossberg from the Wall Street Journal. I talked to Kara, as well as several other writers and bloggers, to understand why. The format, author photos, and bylines make it look like these articles were written for this publication; their presentation is indistinguishable from the convention for any group blog running original content. That’s weak and, in my opinion, appears to be deliberately confusing and deceptive. Also, where the source of the article is acknowledged, there’s no corresponding link to the page/URI to which it refers (something I’d regard as a convention that’s at least a decade old now). Plus, the one puny link back to the source article that I could find is disguised as a “read more” jump link (again a convention that any blogger knows means something else — that the article is continued “inside” the current site). Of course, the combination of republishing the articles in this format without permission and wrapping them in ads makes this even shiftier. I haven’t looked at the licenses for everything they’ve republished, but I’d be surprised if at least one of them didn’t include a “Non-Commercial” attribute. Note also that all the social bookmarking links on the Voices posts point to the AllThingsD article; not the original “borrowed” post. Sure, sites like Digg and Reddit do something similar to aggregate content, but there’s zero confusion about whether it was Digg or Reddit who commissioned the article; the link is right there at the top of their post. Not so here. Also note that, on the Yahoo! Buzz page, the author is listed as “All Things Digital” (not Matt, Joshua, etc). Overall, Kara was very gracious and seemed genuinely interested in trying to avoid confusion. Since we spoke, I’ve noticed they’ve cracked down on excerpts, never citing more than a single paragraph from each author, though the presentation remains the same. I reached out to several other writers that have recently been featured in Voices to see how they felt. Ultimately, if authors are happy, there’s no problem. But it seems like there’s a divide between two types of writers online: unaffiliated independent bloggers running their own sites and bloggers employed by larger online magazines. Employees of larger news organizations don’t seem to have the same concern over the distribution and presentation of their work, leaving that to their employer’s legal department. By all accounts, All Things Digital is a clueful news organization that’s very concerned about ethics and transparency. Unlike feed scrapers, AllThingsD is only running excerpts and clearly intends to drive traffic to the articles they like. But for some independent authors, there’s still room for improvement. Update: In a well-written response, Anil Dash contrasts the authors in this story to the litigious approach taken by the Associated Press this week. Also, more writers that were linked on AllThingsD give their opinions in the comments. Harry McCracken and Jason Preston appreciated the traffic, while Paul Lamere from the Echo Nest felt used. April 10: Yesterday, Jason Kottke discussed a trend that he felt was worse than misattribution — the tendency for popular blogs to extensively summarize and quote articles. April 20: In response to this article, Kara Swisher announced changes to the Voices section. Links on their homepage now go directly to the original article, rather than a version on AllThingsD. On Voices entries, they’ve removed comments and “Share” links, rephrased the “Read the rest of this post” link, and added a long disclaimer to the sidebar. The bio photo, byline, and article design remained the same. Compare then and now. Also, authors without bio photos use generic icons instead of the AllThingsD logo. From a quick glance, this looks for all the world like a shady reblogging site trying to make a buck off of people’s RSS feeds. Haven’t these people read enough blogs to know how to quote and cite posts you’re linking to clearly? The Huffington Post uses a similar “aggregation” technique on its site, with a design that makes it even more difficult to find the original author. HuffPo’s incredible SEO prowess has often led to the excerpt being more prominent in Google than the original article. In some cases the “excerpt” consisted of the entire post — which meant that no click-through was necessary, and HuffPo was essentially running ads on stolen content. The Chicago Reader’s Whet Moser took the site to task in a series of posts last December, which helped draw attention to the problem and eventually led to a change of policy by the HuffPo. Unfortunately, Arianna Huffington is now claiming that an intern did it. So maybe the lesson wasn’t really learned after all. I scrape Oregon blogs and run ads at http://porblogs.com — with permission of each of the blog owners, as well as a say in how many characters they’d like to appear in the excerpts (200-500). Post titles click-thru to owner blogs’ original posts. I don’t allow comments and think I’ve made about $1 on clicks. I’m all for transparency, just like our new President. 1. Post under the byline of the person or editor who recommended it, not the original author. Take responsibility (and credit!) for your recommendations. 2. Display the original source/author prominently. 3. Clearly delineate excerpts as a blockquote. 4. (optional) Include an extra sentence or two describing the link and why it’s worth reading. This gives you some personality. Great blog post. It is rare these days to see such a complete post. Issue identified, explained and researched. Drew: That would be my recommendation, exactly. I think the best practices for linking have been well-established for ages. My impression is that AllThingsD deviated it mostly because they switched from original content to third-party linking in the Voices section, and creating a new template/section was inconvenient for them. I don’t think they’re deliberately trying to mislead. It’s wrong to use anything more than a short excerpt and a link. This is doubly true if the excerpt contains the bulk of the essay’s argument, quadruply true if the excerpt appears at a site that monetizes its content. I don’t think the main issue was with the excerpts or their length (though some were definitely long), but the way they were presented, which strongly implied that the author was writing for All Things D.
I’ve never found the All Things D section to be confusing–they pretty clearly state the author and source of the item. In fact, if not for the Voices column, I doubt I would have ever discovered some of the independent blogs that I now have bookmarked. I’m not a ProBlogger™ like the folks in this article, but I too have seen a sour side of AllThingsD. I released a photo of Steve Jobs holding a MacBook Air for display at MacWorld 2008 under CC 3.0+attrib. The main reason for releasing it was to publish it to wikipedia. This photo is currently being used on Steve Jobs’s page on the english wikipedia, so it becomes extremely easy to find in a google image search. During the whole “is Steve Jobs dying?” news panic that led up to MacWorld 2009, Peter Kafka of AllThingsD served up some fresh copypasta containing Steve Jobs’s letter to the community ( http://tinyurl.com/8pm7rn ). Peter also decided it would be a good idea to use my photo in his article without attributing his source. Sure sounds like an awful day for Kara: Wikimedia was ‘up’ long enough to grab a photo, but went down hard when she was looking for a name to credit. I didn’t let it bother me. Unfortunately, AllThingsD and I seem to part on the definition of “usually,” as they once again posted the same photo on a new article a month and a half later without a hint of attribution. I don’t know what an “expert blogger” is, if these are promoted posts from a community blog (and how does someone write to the FC blog, anyway). The relationship between the publication and the author is just not clear to me. A reminder about my comments policy: I delete comments from anonymous trolls. If you’re going to be a jerk, use your real name and email. This is really bad form. They are presenting what appears to be a blog. In a blog, the byline is the author. This is not a blog, it’s a curation. The byline ought to be the curator, referencing the blog post. This smacks of bad/confusing UI in a variety of dimensions. I think more attention needs to be given to MetaFilter’s “Don’t be a jerk” principle. Kara Swisher can apologize all she wants, but AllThingsD is still being a jerk to the community that they draw from. For the record, All Things Digital’s Voices draws on my pieces from Technologizer quite often, and it’s more than fine by me–it’s good publicity and gets my site traffic, since anyone who’s interested enough to pay attention will end up clicking over to my site to read the whole story. Don’t know if anyone mistakenly concludes that I’mm affiliated with AllThingsD, but if so, I don’t mind–I dig their site, so I’m honored. This is another version of the age-old question of fair use on the web, right? My gut reaction is that this is ok if a person moderately interested in the topic at hand is likely to click through. In that light, I’ll have to agree that the shortened excerpt makes a world of difference with respect to Schachter’s article. The earlier version fully justifies the outrage, where the edited version seems exactly right. Hopefully AllTingsD editors have learned something from this incident? I agree to some extent with Drew’s points, but I think that every site on the web works a little differently. Regular readers of ATD surely know that some links point to internal articles and others to outside content. Presumably they pay attention to their browser’s status line. The particular charge of “feed scraping” seems just silly. Still, having said all of that, it does not really seem that unreasonable to raise an eyebrow at a major media entity getting something THIS wrong. It’s 2008, and the WSJ has egg on its face for playing dirty on the web, which is hard to not read as yet another indication of the doom of the industry as it currently stands. Sending some traffic but not any ad revenue remains an unfair exchange. The industry should develop a mechanism for fractional ad revenue distribution. Excellent post, Andy. It seems like AllThingsD wants to at least appear to be doing the right thing, so calling attention in this way can only help. How long before someone makes a scrape site called http://www.allthingsdbags.com and posts their original content surrounded by ads? Thomas: I disagree completely. That’s the same sort of agreement the AP is demanding of Google, and I think it’s ridiculous. Nobody should be forced to pay for sending traffic, even if it includes a small quote. Fair use works. Interesting post. AllThingsD reblogged one of my posts last week: http://voices.allthingsd.com/20090401/the-loudness-war-analyzed. When I saw the referrer I checked it out and at that time I thought it was just another opportunistic blog regurgitator – it didn’t occur to me that this was owned by a proper and upstanding company like Dow Jones. In general, I don’t mind reblogging like this – but there are a few things that really bug me about this particular instance. First, if they are going to take the time to dig up my picture and my job title and make it look like a byline, they really should send me an email. Second, they didn’t even get my job title right. They cherry picked one item from my bio (industrial co-chair of recsys 2009) for my affiliation while skipping my day job (director at the Echo Nest) for instance. Why did they do that I wonder? What really makes me pissed however, is that they claim copyright for my words. On the AllThingsD TOS page they claim The content displayed on the Web Site, including the selection, arrangement and design of the content of the Web Site (“Content”) is the property of Dow Jones or its licensors, and is protected by copyright and other intellectual property laws. Furthermore, they don’t allow others to do what they do. Their TOS says This Web Site and the Content may be used only for your personal and non-commercial use and may not be edited or modified for any purpose. I think the golden rule should apply here – if you are going to rip my words from my posts and put them on your page then I should be able to do the same with your words. This is fascinating. A post I wrote was featured on Voices back in January, and while it didn’t cause a major traffic spike, I really appreciated the quality of the link, and the traffic I did get. 1) Andy didn’t actually speak to me; he sent me some emailed questions, and I wrote him back. He wrote “I also spoke to Eric Savitz.” But we never spoke; it was e-mail only. 2) To say I didn’t mention my affiliation with Dow Jones implies that I was somehow not being forthcoming. But it is not exactly a secret that Barron’s and the WSJ are owned by the same company. Neither did I mention that both publications are based on the planet Earth. Seems like common knowledge to me. Eric Savitz: I tend to use “speak” interchangeably with “talk,” but that’s inaccurate. I changed it. And I shouldn’t have implied you were holding something back; I removed that bit entirely. It was my own ignorance about the Dow’s other properties that led to the initial confusion. I agree with much of what has been said here already — attribution should be crystal clear, and the templates used for re-posts should be very different from the ones used for site-authored articles. But I do think there needs to be a serious discussion about how much excerpting is too much, like some general netiquette standard/word count guideline to help others know when they’ve stepped over the edge. At quotd (warning: shameless plug approaching), we think you can introduce an argument from a 300 character (or less) excerpt. That should be more than enough to whet the reader’s appetite and introduce the author’s argument, no? For those interested, here is this discussion in excerpted quotes of 300 characters (or less): http://quotd.com/question/should-sites-like-allthingsd-be-able-to-excerpt-and-re-post-other-bloggers-posts/ Is this fair use? Andy: Perhaps you misread my comment. I didn’t advocate “pay for sending traffic.” I suggested that AllThingsD, for example, pay for visits to AllThingsD-hosted stories that have been borrowed from another site that did not result in a click through to content source site. This would be for instances where fair use was clearly not fair. 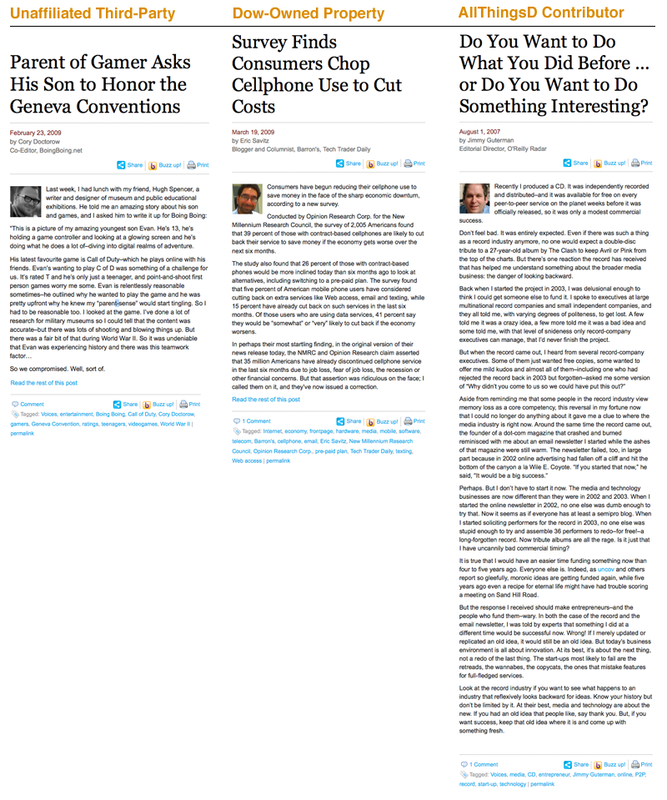 Not every visitor to AllThingsD clicks through to the site from which an excerpt was taken. It strikes me as unreasonable that a site should be able to collect ad revenue from someone else’s work in instances where there’s no click-through revenue going to the original site. Of course the whole issue is that fair use is not clearly defined. And where there’s ambiguity, there’s bound to be abuse. Perhaps a more realistic option is clearer citation and linking standards, perhaps enforced by Google PageRank penalties for improper citation structure. BTW guys, directly reposting a section of text that can be found elsewhere on the internet (as is the case with the voices post) is awful for SEO. It might actually harm AllThingsD’s rankings in Google. Always better to link and describe, rather than link and copy. Hear, hear. Among other things, ellipses and truncation make clear that the writer is *not* working for AllThingsD. In a wonderful way, such shortening is a form of good page design, wiping out the ambiguity that would otherwise imply the writer worked for AllThingsD. How much aggregation is too much? Summary? Whatever your RSS feed says? What if there were ads around that? Why do people forward the reblogged excerpts? Do they forward it before they have clicked through? Do they actually read the article, or do they just like the title and first paragraph? Perhaps the one paragraph version is simply better? This makes a lot more sense when the site produces a one-paragraph summary (eg, BoingBoing on Schachter) than when ATD just has the introduction. I’m sure the presence of a “share” link at ATD and BB makes a difference. It would be interesting to compare what gets promoted when the linked site has its own “share” link. The “larger news organizations” whose employees aren’t bothered have their own share buttons. This discussion seems to be about fair use and copyright, but as I see it, it’s also about the “trademarks” — or at least All Things Digital affecting the “brand” of each author by making it appear they agreed to be be linked to, or even to write for the site. I love that All Things D changed John Grubers title from “Editor” to “Blogger” on his Voice page.